Daily Dzynmkr: I'm seeing orange! My Bhut Jolokia are starting to "blush"
It's been a while since I posted about my pepper plants and I'm happy to report things are going well. On Friday, we had a heat index of 106 degrees. The rest of the weekend has been pretty hot as well. 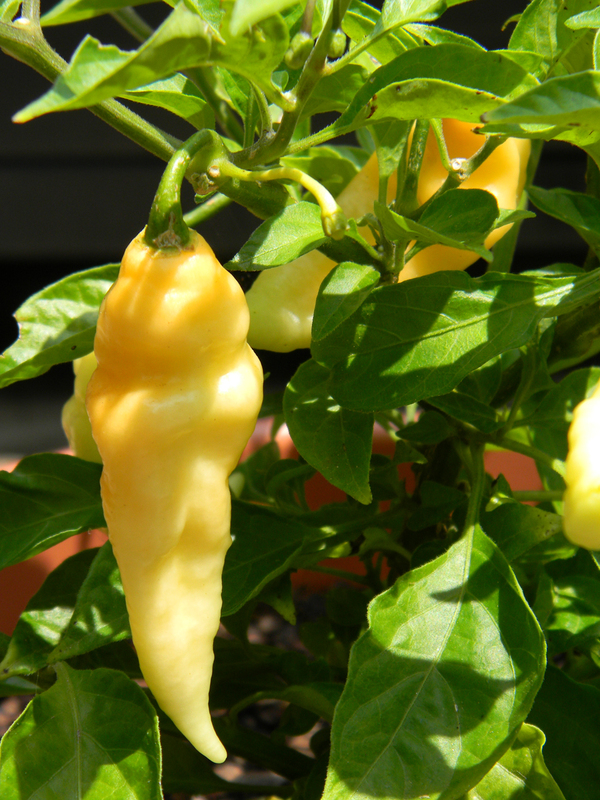 As you've seen in earlier posts...a sudden (or expected) heat wave is always appreciated by these peppers. In fact, it seems like that's when I have the most "action" to report. The progress of color after one day! 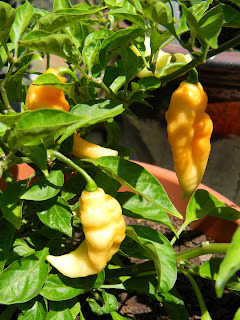 I noticed yesterday afternoon the peppers were starting to turn orange (above). Then, I went to check on them this morning and they are even darker (left). At this rate, I may have red peppers by this time next weekend. Although, I must admit, I'm not sure I want it to stay this hot. I spent a lovely afternoon with my best friend at her brother-in-law's house yesterday. We were under an umbrella by the pool - and I even periodically put my feet in the water - and it was unbearable. Next time, no matter what...I'm getting in the pool! New peppers on same plant. 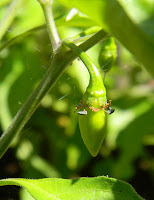 The heat also caused some of the flowers to die away and push out a couple of new peppers. I have tons of flowers on the other plant, but no peppers are showing yet. I guess I should be more patient - considering it didn't even have a flower on it until recently. The experts say the peppers only get as hot as the climate they are produced in. If this summer is any indication of what we can expect...then Scott will be a very happy man! 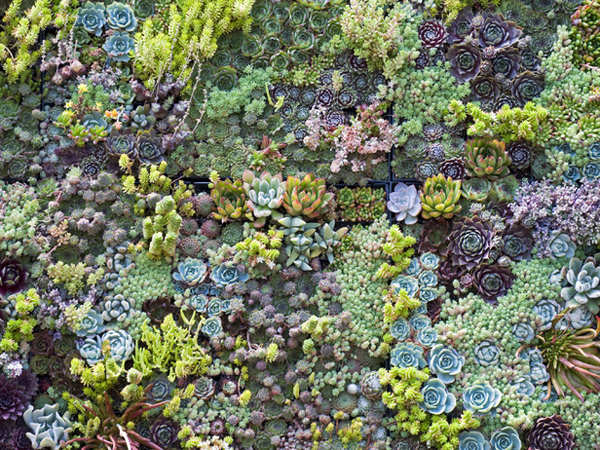 A beautiful mosaic of color in this bed of sedum. I want to share another quick item before I go. I noticed a nice feature on the HGTV.com site talking about container gardens. I thought some of you may find inspiration in the combination of plants used. There are some beautiful photos available and you can follow the link here. I love the colorful bed of sedum. The blues, greens and chartreuses are a great combo together. Take a moment to watch a few "how to" videos if you need to and then go get your hands dirty! Until next time - Happy Gardening and if you are in the South...take care of yourself, your pets and the elderly in this heat.